Home / Blog / family / Family-Themed Costume? by sarahon October 31, 2013 Leave a Comment on Family-Themed Costume? 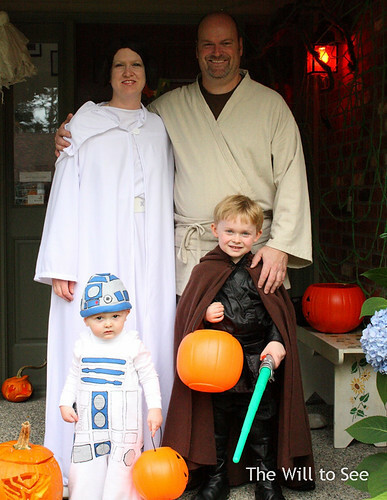 Are you one of those families that don a family-themed Halloween costume? You are probably guessing that we are, but we aren’t. We all dressed up in a themed costume one year, but that was it. I have themed the boys before, but now that they are old enough to have a say that ship has sailed. I do try to have the dog in a theme with at least one of the boys, but it isn’t working this year. Hopefully Islay will tolerate the Halloween costume as well as Mulligan did. If you are doing the family-themed costume this year, hats off to you. Especially if that means that you got your children to agree on a theme. I would love to see your photos, so please post them in comments. Happy Halloween and have a safe evening.